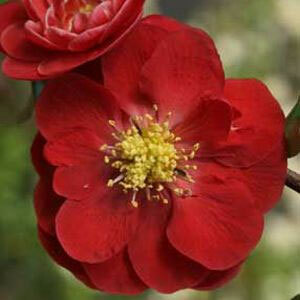 The 'Double Take Scarlet™' Chaenomeles plant bears fully double, Camellia-like blossoms that are a phenomenal shade of red. True to form, the Double Take series is thornless and does not bear fruit. This Quince series is also fairly drought tolerant, once established, and is moderately tolerant of salty soil and climates. A Proven Winners® Color Choice® winner, use this flowering shrub to add brilliant color to your xeriscaping or as a deer resistant hedge. They make fantastic cut flowers too! 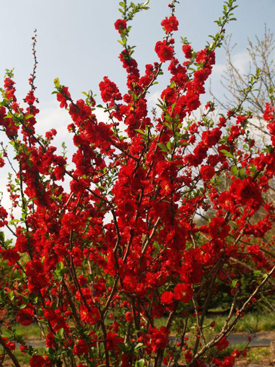 All of our 'Double Take Scarlet Storm' plants are grown and shipped in fine quality growing medium and are guaranteed to arrive alive and ready to thrive.